We recommend that you charge the battery before you start using your OH1. If the battery is completely empty, it may take a moment for the charging to start. See Batteries for detailed information on charging the battery. Note that when your OH1 battery has enough power it will advertise itself to all compatible receivers nearby. A. Wired computer setup is quicker and you can charge your OH1 at the same time, but you need a computer available. This method requires an internet connection. B&C. Mobile setup is convenient if you don't have access to a computer with a USB port, but it might take longer. This method requires an internet connection. Fill in all the physical details required for accurate training data at once, and get the latest firmware for your OH1. Place the sensor into the USB adapter with the lens facing up so that the contacts on the sensor and the USB adapter meet (picture 1). 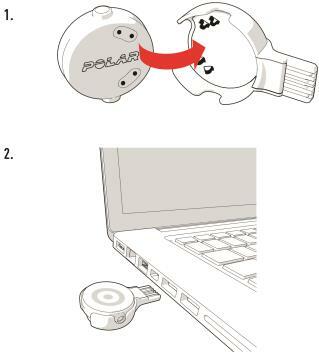 Plug the USB adapter into your computer USB port (picture 2), and go to flow.polar.com/start and install Polar FlowSync data transfer software to your computer. Sign in with your Polar account or create a new one. We’ll walk you through the sign-up and setup within the web service. Polar OH1 connects to the Polar Flow mobile app wirelessly via Bluetooth and ANT+, so remember to have Bluetooth turned on in your mobile device. ANT+ is by default on when you train and sends your HR signal to compatible devices nearby. You can turn off ANT+ in the Polar Beat app settings if you want. Check the Polar Flow app compatibility at support.polar.com. Download the Polar Flow app onto your mobile device. Turn Bluetooth® on, and open Flow app on your mobile device. Turn OH1 on by pressing the button until the LED is switched on, Flow app then prompts you to start pairing. Accept the pairing request and follow the on-screen instructions. Polar OH1 connects to the Polar Beat mobile app wirelessly via Bluetooth and ANT+, so remember to have Bluetooth turned on in your mobile device. Check the Polar Beat app compatibility at support.polar.com. Download the Polar Beat app onto your mobile device. Turn Bluetooth on, and open Beat app on your mobile device. Turn OH1 on by pressing the button until the LED is switched on, find your sensor in the Beat app settings under HR sensor and tap Pair. Follow the on-screen instructions.